The Town’s Planning Services Department has recently released a new draft Official Plan Amendment that affects the lands in the Midtown Oakville area. This new draft Official Plan Amendment is intended to replace the amendment proposed in 2014, but put on hold by the Town (as discussed here). 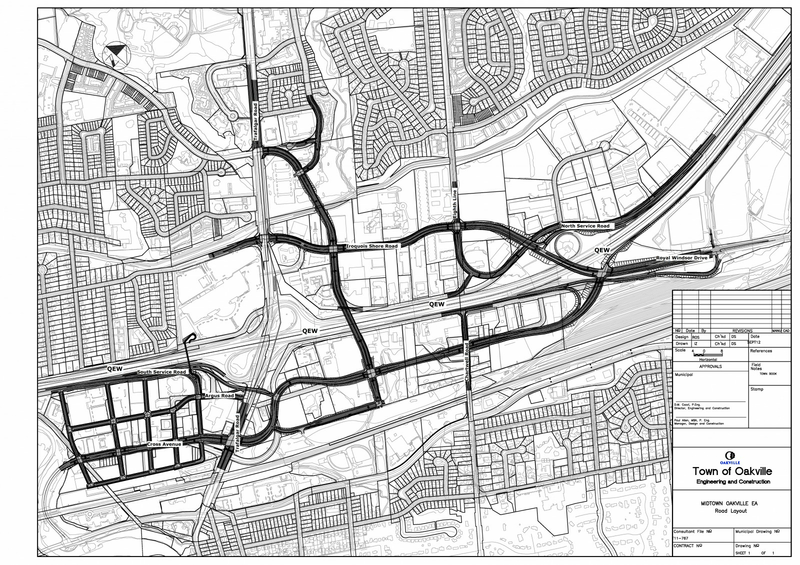 The Midtown Oakville Area, as depicted in the map above, is the area surrounding the Oakville GO Station and the Trafalgar Road/QEW intersection. However, the lands affected by this draft Official Plan Amendment extend as far as Royal Windsor Drive to the east and McCraney Street to the north. Depending on where your property is located, some of these changes may have a significant effect on your land. It is recommended that you carefully review the proposed road network to determine what impact the proposed changes may have on you. More information about this Official Plan Amendment process can be found here. The statutory public meeting under the Planning Act for this proposed Official Plan Amendment is scheduled for July 10, 2017 at 7:00PM before Town Council. This will be an opportunity for the public to provide feedback to Council and to try to influence what changes are ultimately approved. Participation in the statutory meeting also ensures that your future right of appeal is protected. If you fail to make submissions to the Town orally or in writing on a proposed Official Plan Amendment before it is passed by Council, then you lose your right to appeal the amendment approved by Council to the Ontario Municipal Board (should you end up wanting to do so). It is strongly recommended that you, or a representative on your behalf, take part in the statutory meeting if you are concerned about the impact of the proposed changes. For more information on the changes to the Midtown Oakville area or how your property may be affected, please feel free to contact us.